Bilingual signs at a west London railway station are to be taken down after complaints from ethnic groups. Signs at Southall station appear in English and Punjabi. Two weeks ago train operator First Great Western (FGW) decided to remove the signs after receiving calls for other languages to be displayed. FGW said it would be impossible to display every language and it would be consulting the community to find a permanent solution. 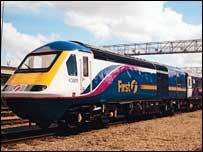 A FGW spokesman said it was awaiting a date for a meeting between its managers and Ealing MP Virendra Sharma. In the mean meantime he said the company would be adopting government guidelines which require only the English language to be used. According to FGW signs have been displayed in English and Punjabi for about 12 years after an agreement between the council and the community. However it was forced to take action after ethnic groups in the Southall area "raised issues with the use of station signage in one specific language other than English". A statement said: "We have therefore consulted within the community and have decided to review the signage. "However desirable in our diverse culture, it would be impossible to provide station signage for every language, but we... hope to reach a solution that meets the needs of local people as soon as possible."